BERG Cosmetics, a range of care products especially created for the Dolce Vita Hotels, combines the power and beauty of South Tyrol’s nature. BERG Cosmetics are based on ten medicinal herbs which grow on the sun kissed slopes of the South Tyrolean Mountains. The skin is a unique sensory organ and a natural layer of protection which requires very special care. Cosmetics which contain harmful ingredients can damage the skin permanently. The popular range of BERG Cosmetics of the Dolce Vita Hotels is created from pure, natural ingredients, relieves your skin and promotes your natural beauty. 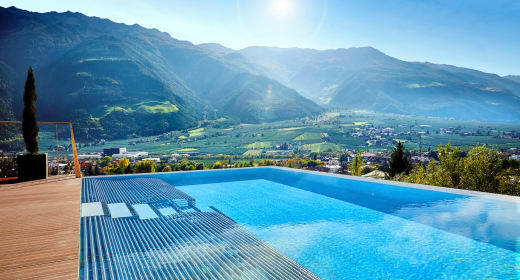 See for yourself and try the products of Dolce Vita BERG Cosmetics on your wellness holiday in South Tyrol. BERG Cosmetics are part of holistic care and only contain pure, natural and organically grown ingredients. All herbs used for the production of the Dolce Vita cosmetics range are grown at the South Tyrolean Kräuterschlössel. The South Tyrolean herb growers do not use any chemical pesticides, copper, sulphur or artificial fertilizer. The herbs are watered with pure glacier water from the Ortler Mountains and are picked by hand. The Dolce Vita Hotels are aware of nature’s powers and use them for your beauty and wellbeing as best as possible. Treat your skin to a pampering programme with BERG Cosmetics especially in November when the days get shorter and the nights longer. Leave everyday life behind and enjoy the cosy Dolce Vita Wellness Hotels: Send your non-binding booking inquiry today and look forward to soothing beauty treatments – with BERG Cosmetics, naturally.